The importance of that piece of string: in this case it is for making ultralight thongs/sandals from shoe inserts (these are ‘Redbacks’): 58 grams the pair in Size 8. Great for camp shoes, river crossings, etc. Also: the Gossamer Gear Sitlight Pad @ 30 grams (apart from keeping your bum dry for trail lunches on wet days) will make two pairs of same with the addition of a bit of string if your shoes let you down – and may get you out of trouble. See: http://www.trailquest.net/sandals.html My knots are different from Brawny’s : I pass a (doubled) loop up through the gap between the big toes and have an overhand knot under the thong. The two ends come up through each side of the thong towards the rear (as with normal thongs) and are joined to the loop with two overhand knots. 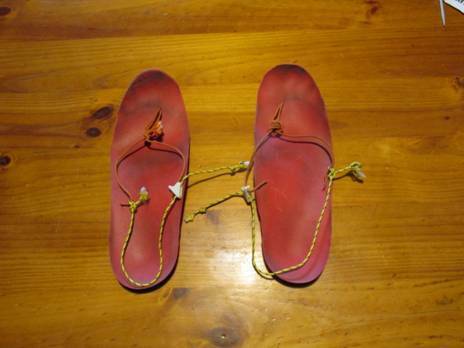 To make them into sandals a bit of elastic (or a ‘clam cleat’ micro cord lock and string – as shown) either over the top of the foot or around the heel and joined to the strings at the rear where they emerge on the top side of the thong works well and will ensure they stay on during river crossings. PS: My next pair will have small brass grommets where the cord goes through to prevent the sole tearing and either elastic or micro cord locks for the heel section to make them easier to put on (& better to stay on). I will also try a pair in a thin (eg4-6 mm) rubber material such as light floor mats for cars are made from (to increase durability). You can buy Vibram shoe repair sheeting for this purpose, but it is too expensive. I am also working on Dyneema ‘jiffy’ over- shoes for them (which should weigh @ 25 grams ea) and whose soles might be reinforced with some paint-on rubberising compound – I will try roof and gutter silicon to begin with.